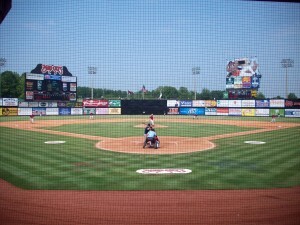 Ballpark Basics: Even one of the best logos and mascots of the minor leagues can’t save this stadium from itself. 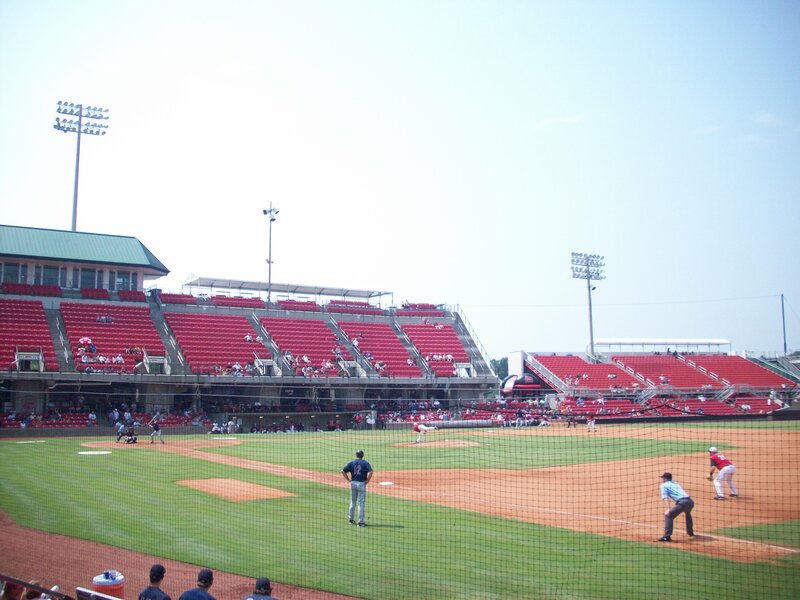 Ballpark Breakdown: The Mudcats home, Five County Stadium, is named because of its close proximity to the intersection of the county lines between Wake, Franklin, Nash, and Johnston Counties, and Wilson County are also in the general area of the stadium. The name evokes thoughts of small rural communities coming together to support a local team – the reality is that the stadium was dropped in the middle of a parking lot off of Highway 29. Having to drive 20 miles outside of Raleigh to pay $4 for parking does not start the visit off on a pleasant note. It is one thing do put a ballpark in the middle of nowhere and surround it with your own parking lot. It’s another to charge for parking (surrounded by miles and miles of open space), and not give people any alternative. As it turned out, our first disappointed impressions were accurate. 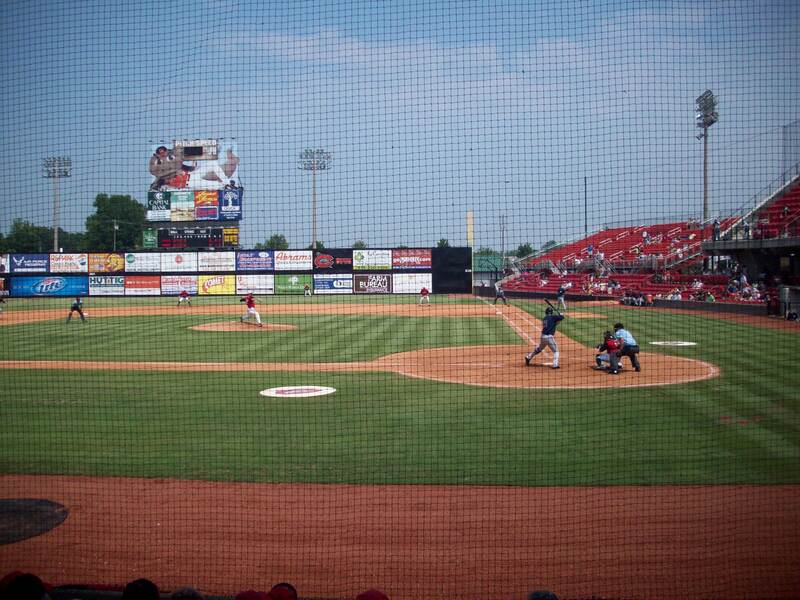 In fact, it’s possible the only redeeming feature of this park might be the water tower behind left field, that is painted to resemble a baseball with the Mudcats logo (which we’ll say again, really is one of the best in the minors). The lower bowl consists of only four rows of seats so the majority of the seating is in the upper deck. The few rows of the lower level are completely covered by the upper deck giving these seats an almost claustrophobic feel. The netting extends all the way to the outfield so you have to watch the game through a net pretty much no matter where you sit (this is a disturbing trend we have noticed in some other parks but this place takes the cake). With the upper deck being so close to the action you would think these are the seats to take. However, when you see the grade of the upper deck you might feel the need to get your rappelling equipment just to get to the fifth row. The configuration of the seats is so odd that they were actually featured in an ESPN column about some of the most unusual seats in the minors. Jim ended up hating this park because the behind home plate netting extended all the way from one end of the outfield to the other, and any sunshine or overhead view was blocked by the concrete slabs of the upper deck; which means even when paying for some of the best seats in the house, you’re paying for an obstructed view. 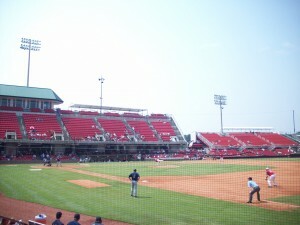 **Update** Recently signed deals have got the Mudcats moving to Pensacola, Florida for the 2012 season and talk that the Kinston Indians will be moved out of Kinston, NC and into Five County Stadium. That makes 2011 the last chance to see these teams in their current incarnations. Plan your visits while you still can! 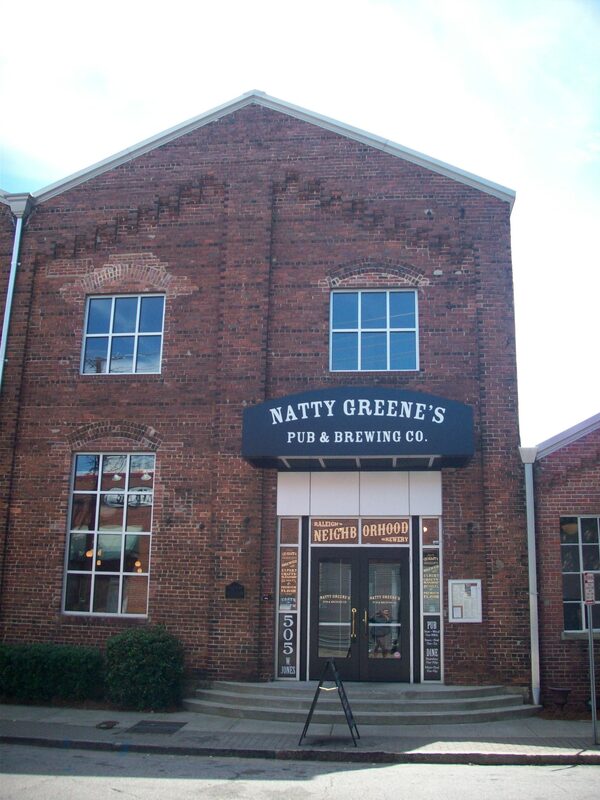 Brew Basics: The second (and possibly even better) installment of the Natty Greene dynasty. 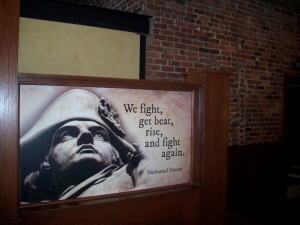 In our opinion, the only problem with this brewery is that it hasn’t opened up in our home town yet. 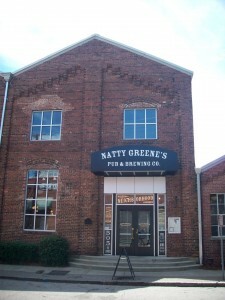 The Raleigh Greene’s is different in many ways than the original in Greensboro, including which beers and swag are available, but they share the same southern touches and great beer to connect one bar to the other. This early fall weekend, we encountered fun, friendly staff, who were just as excited about the first weekend of football and the return of Oktoberfests as we were. 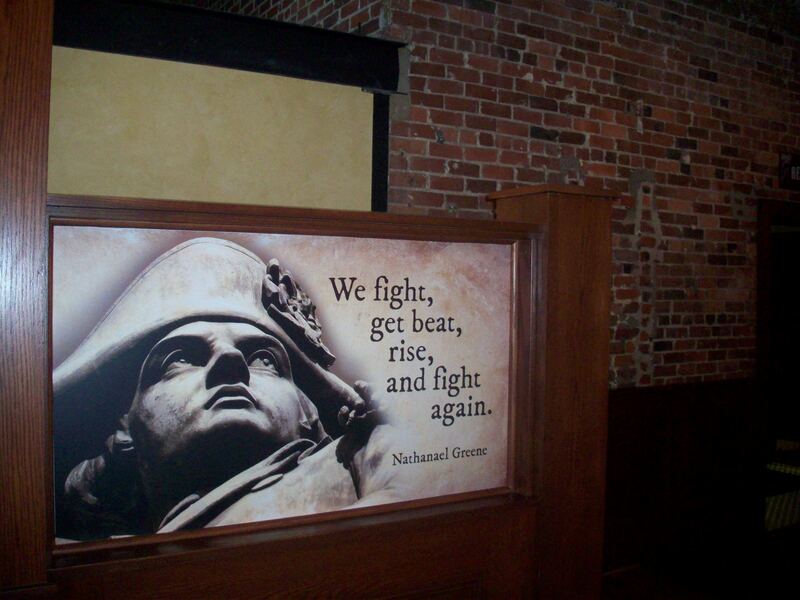 This Greene’s is even larger than the first, and ratchets the historical aspect up a notch with some well placed quotes and lithograph etchings in an absolutely beautiful and HUGE building. Happily, just like the Greensboro Greenes, the Raleigh site is a great place to hang out, with plenty of billards, darts, electronic games, party rooms, dance space and most importantly, a beer list where you can’t go wrong. Overall, you really must stop by if you’re in the area. 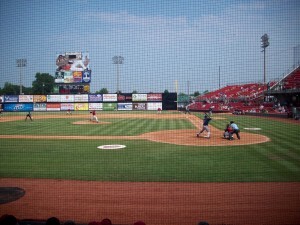 All their beers are unfiltered, and as we’d already hit the basics when we reviewed the Greensboro location and the Grasshoppers ballpark, on this visit we stuck to their newly released seasonals, and we weren’t let down. Oktoberfest Lager: 5.4%ABV and looks just like apple cider. Because it is unfiltered, this didn’t have as much of the traditional spices and smells one typically associates with an Oktoberfest, and was actually like a deeper colored, less fruity hefeweizen. Solid, well rounded flavors without being chewy, and remaining flavorful from first taste to aftertaste. Farmstead Saison: (6% ABV) As with the Cream Ale at Fullsteam, this is another beer style that was fairly new to us. According to homebrewtalk.com, a saison is “the name originally given to refreshing, low-alcohol pale ales brewed seasonally in farmhouses in Wallonia, the French-speaking region of Belgium, to refresh farm workers during harvest season.” and Greene’s aptly named Farmstead lived up to the billing. This beer smelled like cloves, and flavored with fruit. It was a beautiful true golden color and tasted just like a full bodied wit beer, strong, solid flavor that was very refreshing. Hessian Hefe-Weizen: (5% ABV) this is in many respects a traditional hefeweizen – unfiltered with a light golden color, fruity and bready aroma, with a chewy palate. What makes this unusual is that banana is one of the main flavors in this brew. It was honestly a turn off at first (common sense tells you these flavors would not a great combination make). Surprisingly, the banana was definitely there, but not overpowering, and really complimented the traditional taste of this moderately carbonated, medium bodied wheat beer.